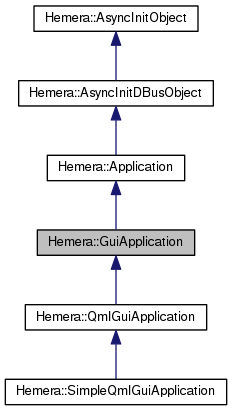 The base class for Hemera Gui applications. GuiApplication holds all the needed logic for applications based upon QWindow. This includes all QtQuick 2 applications. It follows all of the paradigms of Application, and is meant to be subclassed when you have a specific need to handle all of the logic from QWindow up. If you are relying on Qt Quick/QML, you might be better off sublcassing QmlGuiApplication or SimpleQmlGuiApplication. GuiApplication requires your device to support a working 3D stack. Please enquire with your representative to find out if that is the case. Running a GuiApplication on an unsupported device is, besides unsupported, likely not to be working. GuiApplication manages the state of your application's window visibility and more. As such, you should provide your Window to be managed. You won't need and must not call show or any similar modifier method on your window, and instead let GuiApplication manage it. Usually, setMainWindow should be called during the initialization procedure of the application. You should not use this function if you are using a higher level implementation of GuiApplication such as QmlGuiApplication. Use the higher level alternatives instead.